Perhaps the most interesting — and tasty — Single Malt blend of the year. Auchentoshan sounds like the name of a medieval warrior, but it actually translates from Gaelic as “the field in the corner.” The locals call it “Glasgow’s Malt Whisky” because the distillery sits nearby, and it is one of the few remaining Lowland Single Malt Whiskies left in the world. But what you really need to know is that Auchentoshan does four things that make it special: they lightly malt the barley, it never gets anywhere near peat smoke, it’s triple distilled, and it’s aged only in premium Bourbon, Sherry, Port, and Wine casks. “The Bartender’s Malt” is an interesting new idea. Auchentoshan holds an annual “New malt Order” cocktail competition among bartenders. A jury of the top twelve contestants from around the world are gathered together to taste and blend barrels from the Auchentoshan warehouses. Each year there is a different set of bartenders selecting different casks — making it a strictly limited release that tastes a bit different each year. But as you might guess, Auchentoshan has a long history of using wine-finished casks across Whiskies aged up to twenty years, but that signature rich chocolate aroma they are famous for still shines through. 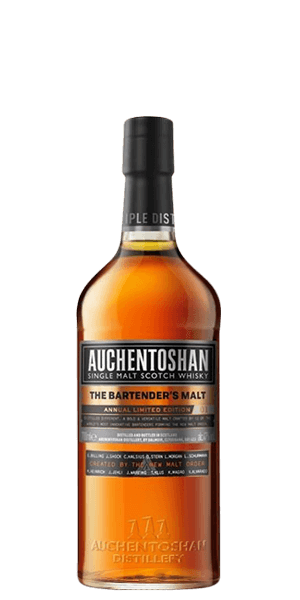 What does Auchentoshan The Bartender's Malt taste like? The Flavor Spiral™ shows the most common flavors that you'll taste in Auchentoshan The Bartender's Malt and gives you a chance to have a taste of it before actually tasting it. Apricot, milk chocolate, and tobacco leaf. Croissants and clotted cream with a dash of pear and ginger spice.